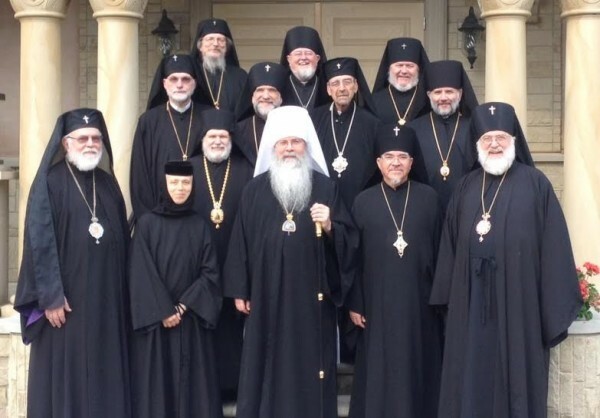 The annual retreat of the Holy Synod of Bishops of the Orthodox Church in America concluded on June 11, 2015. In addition to participating in the daily cycle of services at Holy Dormition Monastery, Rives Junction, MI, retreat site, and reflecting on a number of spiritual themes, including that of the forthcoming 18th All-American Council, the hierarchs engaged in sessions of a practical nature. Highlights of these sessions include the following. – It was decided to issue a letter releasing the Former Archbishop of Washington, Metropolitan Jonah, to the Russian Orthodox Church Outside of Russia. His release becomes official with his receipt of said letter. – The hierarchs reaffirmed their full support for the Statute revision slated to be presented at the 18th All-American Council. Parishes are encouraged to share and review proposed revisions prior to the AAC. They also expressed support for the revised resolution on Finances. – The hierarchs decided that all monastics are to be formally enrolled in their respective monasteries with appropriate records to be kept by the monasteries and diocesan hierarchs. Monastics not in residence at a monastery are to be enrolled in the diocese in which they reside. Diocesan bishops will see to the spiritual care of monastics. Likewise, it was decided that all retired military chaplains, upon their release from military service, will be transferred from the omophorion of the Metropolitan to the omophorion of the bishop in whose diocese they reside. – The members of the Holy Synod heard a report from Archpriest Leonid Kishkovsky on current events in world Orthodoxy.